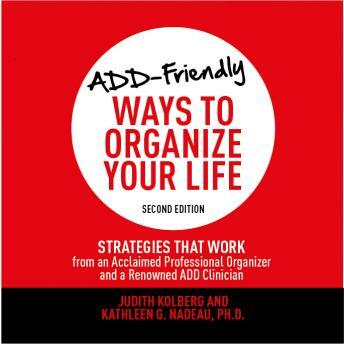 Acclaimed professional organizer Judith Kolberg and Dr. Kathleen Nadeau, renowned ADHD clinical psychologist, are back with an updated edition of their classic text for adults with ADD. Their collaboration offers the best understanding and solutions for adults who want to get and stay organized. Listeners will enjoy all new content on organizing digital information, managing distractions, organizing finances, and coping with the "black hole" of the Internet. This exciting new resource offers three levels of strategies and support: self-help, non-professional assistance from family and friends, and professional support; allowing the listener to determine the appropriate level of support.